Galaxies can broadly be divided into two types: blue, star-forming spiral-type galaxies and red, quiescent elliptical galaxies with little star formation. The star-forming galaxies tend to have younger stellar populations and relatively more ultraviolet (blue) light, while the quiescent galaxies have older stars with more infrared (red) light. Made famous by Hubble’s classification scheme, this dichotomy has been known for some time, but its origin still remains a mystery. Specifically, one of the most significant open questions in astronomy is the exact mechanism by which star formation is stopped, transforming blue, star-forming galaxies into red, quiescent galaxies. One of the favored explanations for the underlying cause of this galaxy transformation is Active Galactic Nuclei (AGN), compact regions of extremely high luminosity in centers of galaxies, originating from material falling onto a central supermassive black hole. AGN activity in the form or jets, winds, or intense radiation can heat up the hydrogen gas in the galaxy or blow it out completely, thus preventing the gas from cooling and contracting to form stars (referred to as AGN feedback). In order to investigate the importance of AGN in quenching star formation, the authors study a sample of 123 massive, high-redshift galaxies (1.5 ≤ z ≤ 2.5), and measure the fraction of star-forming and quiescent galaxies that host an AGN. These galaxies are particularly interesting because they likely evolve into massive elliptical galaxies with little star formation, similar to those found in the local Universe. Furthermore, at z ~ 2, AGN activity is believed to be near its cosmic maximum, and quiescent galaxies already represent a significant fraction (30-50%) of all massive galaxies, indicating that the quenching of star formation may be underway at this redshift. Stacked X-ray images for the quiescent and star-forming galaxy samples in three energy bands. For both the star-forming and quiescent samples, the top (bottom) row shows the non-detected (detected) galaxies. Unfortunately, determining the AGN fraction at these redshifts is difficult because AGN activity can be mistaken for star formation, as described recently in this astrobite. However, this degeneracy can be broken by studying the X-ray light from galaxies, as the authors have done in this work. In comparison to a star-forming galaxy, a galaxy whose light comes mainly from an AGN will either have a higher X-ray luminosity or a “harder” X-ray spectrum, meaning that more photons are measured at high energies. Using the X-ray data from the Chandra Deep Field-South Survey, the authors are able to measure X-ray luminosities for their galaxy sample, and infer the fraction of these galaxies that host an AGN. They also divide their full sample into quiescent and star-forming galaxies and investigate any differences in the AGN fraction for these subdivisions. The figure to the right shows the stacked X-ray images for the quiescent and star-forming galaxy samples in three energy bands (full: 0.5-8 keV, soft: 0.2-2 keV, hard: 2-8 keV). 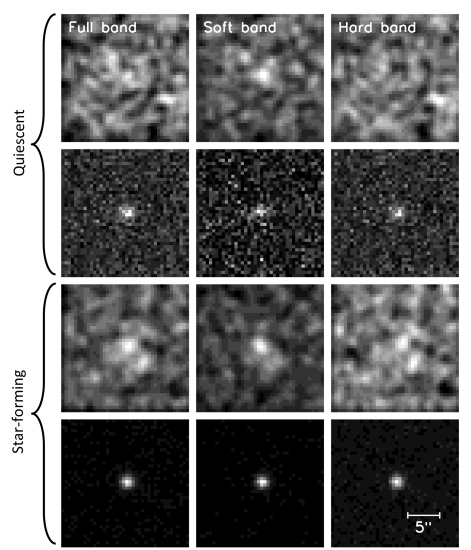 The figure shows the stacked images of both the individually non-detected (top row) and detected (bottom row) galaxies. Based on their X-ray luminosities, the authors find that 22 ± 5% of the galaxy sample hosts a high-luminosity AGN. They also find that this fraction is similar for quiescent and star-forming galaxies (19 ± 9% and 23 ± 5%, respectively) and is independent of the stellar mass of the galaxy. 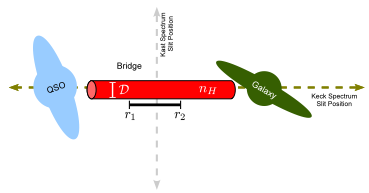 These results suggest that the presence of the high luminosity AGN is not connected with the internal galaxy properties, but rather due to some external process. The authors note that other studies have found that major mergers between galaxies can trigger bright AGN and that their results are consistent with this conclusion. The authors also investigate the possible presence of low-luminosity AGN in their galaxy sample by comparing the X-ray luminosity of the stacked, individually non-detected galaxies with the X-ray luminosity expected from just star formation. They find a significant excess of luminosity for the quiescent galaxies, indicating that these galaxies likely host low-luminosity AGN. They estimate that between 60-100% of their quiescent galaxy sample likely hosts a low-luminosity AGN, while only between 0-40% of the star-forming galaxies hosts a low-luminosity AGN. This discrepancy between quiescent and star-forming galaxies suggests that feedback from low-luminosity AGN may quench star formation initially and then continue to keep it at a low level. The authors’ work presents the first observational evidence that the majority of massive, quiescent galaxies at z ~ 2 host a low- to high- luminosity AGN, while this fraction in star-forming galaxies is much lower. The results are consistent with a picture where high-luminosity AGN are triggered by major mergers, and low-luminosity AGN are the dominant mechanism for stopping star formation. With further analysis and even larger samples of galaxies, this picture is likely to become even clearer. Wonderfully written article, Nick! Perfect amount of background introduction and I followed it the whole way through. There was a paper on arXiv I read a while back (http://arxiv.org/abs/1206.4063) that seemed to indicate that quasars, at least in heavily obscured galaxies, were not the result of major mergers. I’m wondering if this study addresses this at all (since it seems to indicate major mergers at least drive high luminosity AGN), if they’re actually separate samples, or if for some other reason this isn’t really an issue but just confusion resulting from my ignorance.